You’ve invested in a customized storage system that perfectly suits the needs of your company and paid to have it installed. Now your company is benefiting from the improved efficiency that your new layout provides, and your material handling operations are running much more smoothly. The racks in your system are key to the continued success of your operations, so what are you doing to protect them? 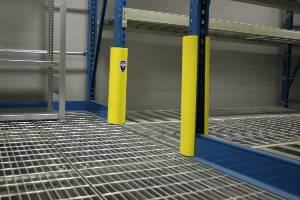 Incorporating protection items into your racking system is a must to avoid or slow the wear and tear process. Protection products should not be viewed as ‘accessories’ to your system, but as essential items that serve the important function of keeping employees safe and stored materials protected. REB specializes in identifying areas where protection products should be incorporated and will provide you with a detailed list of these concerns. We work with top manufacturers that enable us to supply and install only the highest quality safety products. Frame Extensions keep product from falling off the top of the rack. Beam Safety Locks should be in working condition and properly locked. Any missing safety locks should be replaced immediately to avoid beam failure. End of Row Protection should be present at all row ends to keep equipment from running directly into frames. 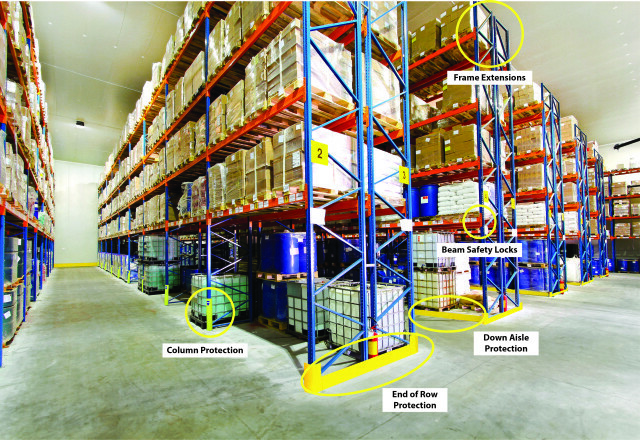 Column Protection is a preventive way to avoid damaged columns and possibly a rack collapse. Accidents can happen no matter how conscientious your material handling team is on a daily basis. 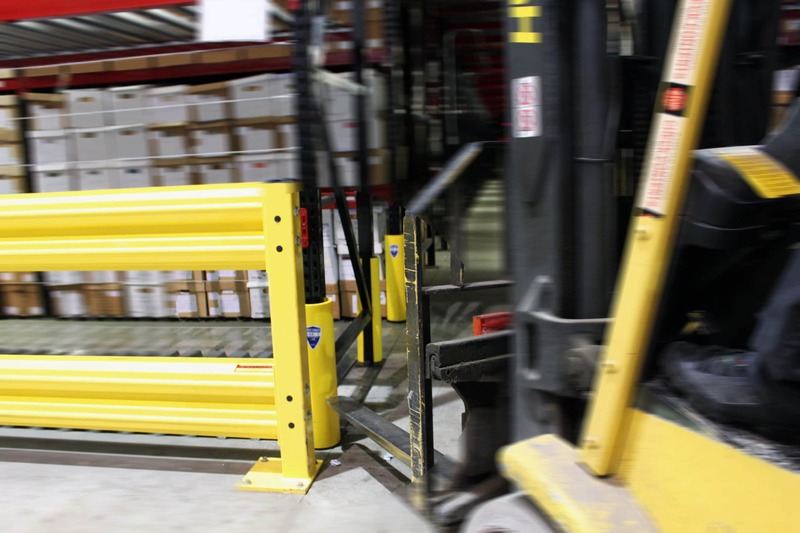 Since you can’t completely prevent accidents from occurring in your warehouse, taking steps to ensure that your racks are protected in the case of a collision is the best way to protect your investment in your storage system. 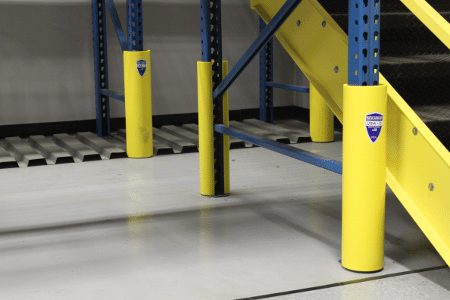 Available at REB Storage Systems International, Rack Armour post protectors are an effective way to minimize the risk of serious damage to the racks in any warehouse. Rack Armour is an innovative, tough and inexpensive device with which to significantly reduce damaged rack costs. In scientific tests, it was shown to be so effective that it reduced rack damage by as much as 80 percent. Made from ballistics-grade polymer, it is designed to withstand the impact of even severe collisions. 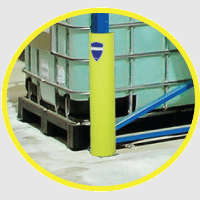 In addition, it is impervious to moisture, harsh temperatures and other undesirable conditions that can affect other types of post protectors. The snap-on installation technique of Rack Armour is completed in seconds, with no anchors required. 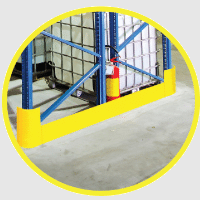 In addition, the bright color increase the visibility of racking systems, making equipment operators more likely to spot racks in front of or behind them. This can prevent accidents from even occurring in the first place and reduces the chances of on-the-job injuries and damaged merchandise. 1. The outer shell acts as a shock deflector and is constructed of HDPE (High Density Polyethylene), a major ballistics polymer that is used in the manufacture of bullet proof body protection. 2. The second line of defense is a foam insert that acts as a shock diffuser. These work together to provide the ultimate defense against upright damage. Fill in the contact form or call REB Storage Systems International at 800-252-5955 to schedule an appointment with one of our safety and repair specialists who can perform an inspection of your warehouse and provide safety product recommendations. RACK ARMOUR PDF: Is Rack Armour Right for You? RACK ARMOUR VIDEO: How Much Impact Can Rack Armour Withstand? DO YOU NEED RACK PROTECTION PRODUCTS? If you need a complete rack protection system, we can help. We've been creating rack protection systems for more than 50 years.